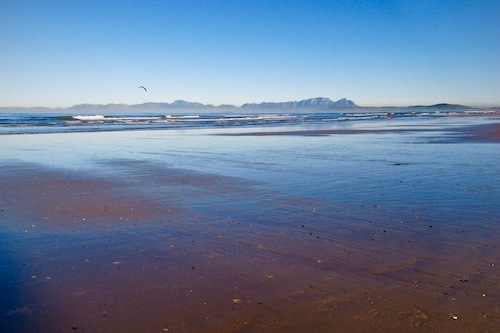 This photo from Strand beach, taken at 8:15 this morning, shows what a beautiful day it is in the Cape today. It’s warm but not too hot, with not a breath of wind. Sadly there is a cold front on the way, due to arrive tomorrow, that will bring some more rain. This entry was posted in Photos, Thoughts and tagged Beach, spring, Weather. Bookmark the permalink.